One of the stories that really intrigued me for many years was the origin of Rama-Tut. In part because it was one of the early Lee/Kirby Fantastic Four stories, but also because, by the time I started getting into comics, it had been followed up on twice. The new stories interestingly retconned the history a bit without actually changing it, just adding to it. I really enjoyed Steve Englehart's West Coast Avengers story here, and thought he handled things extremely well. At any rate, a few years back, I sat down and sorted out a specific panel-by-panel chronology of how all the stories and how they intersect one another. I had originally presented it to the Marvel Chronology Project, and it was used; however, it gets into a lot more detail than they generally present on their site. So I thought I'd re-present it here in its entirety, for anyone interested. 2958 BC - Rama-Tut crashes in ancient Egypt. He later cites that, when he captures the West Coast Avengers in 2940, he has been ruling for ten years. A minor issue here, though, is that in Rise of Apocalypse #1, there is a span of seventeen years given between Apocalypse's birth and the appearance of the Fantastic Four, AND that Rama-Tut was already instituted as Pharaoh at the time of Apocalypse's birth. Since we clearly establish in other stories that Rama-Tut had multiple reigns, I placed the original crash prior to Apocalypse's birth and am assuming that there is a period during Apocalypse's adolescence where Rama-Tut is removed from the throne temporarily. Thus, his line in West Coast Avengers #21 would refer to ten years of CONTINUOUS rule. Same crash, a half-second later. Baal finds Rama-Tut in the wreckage. Appearances by Baal, Rama-Tut. Rama-Tut realizes he can't see. Appearances by Rama-Tut. Rama-Tut is healed by Baal. Appearances by Baal, Rama-Tut. Rama-Tut takes control using his advanced technology. Appearances by Rama-Tut. 2957 BC - Apocalypse is born. Appearances by Apocalypse, Baal. Rama-Tut returns to Baal's tribe, looking for Apocalypse. Appearances by Baal, Rama-Tut. Rama-Tut rules Egypt and recognizes Apocalypse's potential. Appearances by Apocalypse, Ozymandius, Logos, Rama-Tut, Nephri, Baal. Baal and Apocalypse wander around and find Rama-Tut's underground technology. Appearances by Apocalypse, Baal, Ozymandius, Nephri, Rama-Tut, Logos. Apocalypse begins to realize his power. Appearances by Apocalypse, Baal, Ozymandius, Logos, Nephri. 2940 BC - The West Coast Avengers, trying to deal with a partially-working time machine, land in ancient Egypt only to be captured by Rama-Tut, who seems to have been expecting them. He stuns them into unconsciousness. Appearances by Hawkeye, Iron Man, Wonder Man, Tigra, Rama-Tut. The Fantastic Four go back in time to find an optic nerve restorer for Alicia Masters. They fight with an army of Egyptians before being captured by Rama-Tut himself. Again, he stuns the heroes into unconsciousness. Appearances by Human Torch II, Thing, Mr. Fantastic, Invisible Girl. Apocalypse is enslaved to help build a pyramid. Appearances by Apocalypse, Ozymandius, Isis. 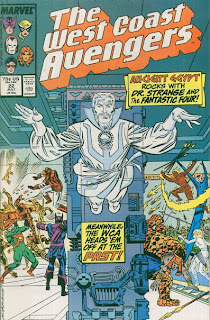 The Avengers are led by a Khonshu Priest. Appearances by Hawkeye, Iron Man, Wonder Man, Tigra, Khonshu Priest. Stephen Strange, searching for Morgana Blessing's soul, travels back in time. Searching through Rama-Tut's Sphinx, he unexpectedly encounters a barrage of automatic blasters that render him unconscious. Appearances by Dr. Strange. The West Coast Avengers run across Strange being carried away by two droids. They attack the droids, only to have more come out of the woodwork. Four new droids pick up Strange and carry him off as the Avengers battle the hordes of robots. Appearances by Hawkeye, Iron Man, Wonder Man, Tigra, Dr. Strange, Khonshu Priest. Strange is carried away by four robots. Appearances by Dr. Strange. The robots carry Strange into a room. Appearances by Dr. Strange. Just as the lid closes on the sarcophagus, Strange manages to release his astral form which would have trapped it inside. This scene is duplicated in West Coast Avengers #23 pg. 7 p. 4 (flashback). Appearances by Dr. Strange. The Avengers arrive just after sarcophagus lid closes. They try to release Strange but, since Wonder Man can't even open the lid, they opt to let him remain in stasis while they look for the Fantastic Four. Appearances by Hawkeye, Iron Man, Wonder Man, Tigra, Dr. Strange. Strange wanders around in his astral form and is surprised to find Rama-Tut's throne room. Just after he enters, the guards bring forth the still-unconscious Fantastic Four. Strange scans Reed's mind to see the events leading up to their capture. Appearances by Dr. Strange, Rama-Tut, Mr. Fantastic, Invisible Girl, Thing, Human Torch II. Rama-Tut gloats to himself. Appearances by Rama-Tut, Logos. The Avengers continue to run through the corridors and find a room which is monitoring the throne room. As they enter, they see the Fantastic Four beginning to gain consciousness. Appearances by Hawkeye, Iron Man, Wonder Man, Tigra, Rama-Tut, Invisible Girl, Human Torch II, Thing, Mr. Fantastic. The Fantastic Four awaken and Rama-Tut makes introductions. This scene is duplicated in Rise of Apocalypse #3 pg. 7 p. 4 and Dr. Strange #53 pg. 10 p. 5. Appearances by Human Torch II, Thing, Mr. Fantastic, Invisible Girl, Rama-Tut. Logos questions his ruler's actions and notes that they're speaking in an unusual language. Appearances by Rama-Tut, Logos. More introductions and posturing. Appearances by Human Torch II, Thing, Mr. Fantastic, Invisible Girl, Rama-Tut. Rama-Tut dismisses Logos, who questions what he's been witness to. Appearances by Rama-Tut, Logos. Rama-Tut recounts his origin. This scene is duplicated in Rise of Apocalypse #3 pg. 8 p. 5-6. Appearances by Rama-Tut. More recounting. This is duplicated (in somewhat mutated forms) in Dr. Strange #53 pg. 11 p. 1-2 and Rise of Apocalypse #3 pg. 9 - 10 p. 2. Appearances by Human Torch II, Thing, Mr. Fantastic, Invisible Girl, Rama-Tut. Rama-Tut dismisses the FF and has the Invisible Girl sent off to get dolled up. Strange's astral body is shocked into "unconsciousness" from an encephaloprobe on his real body. Appearances by Dr. Strange, Human Torch II, Invisible Girl, Thing, Mr. Fantastic, Rama-Tut, Morgana Blessing. Rama-Tut humiliates the FF. Appearances by Human Torch II, Thing, Mr. Fantastic, Rama-Tut. Apocalypse meets Nephri and finds out what happens to Logos. Appearances by Apocalypse, Nephri, Rama-Tut, Ozymandius, Logos, Osiris, Invisible Girl. Sunrise, the next day. Appearances by Apocalypse, Nephri, Ozymandius, Rama-Tut, Logos. The same morning. Apocalypse rebels against Tut and his lackeys. Appearances by Apocalypse, Rama-Tut, Oxymandius, Nephri, Logos. Strange wakes up "over an hour later" and finds Morgana Blessing. Appearances by Dr. Strange, Morgana Blessing, Invisible Girl, Thing. Susan's makeup is finished and she is escorted away. Appearances by Morgana Blessing, Invisible Girl. Ben's big escape sequence. This sequence is duplicated in Dr. Strange #53 pg. 13 p. 2-5 and West Coast Avengers #23 pg. 7. p. 5-6 (flashback). Appearances by Thing. Strange directs Ben back towards Rama-Tut's throne room. Appearances by Dr. Strange, Thing. Ben barges in on Rama-Tut and Susan being entertained by Torch. This scene is duplicated in Dr. Strange #53 pg. 14 p. 1-2. Appearances by Human Torch II, Thing, Rama-Tut, Invisible Girl. The Avengers finish off the robots and run into a room full of guards. Appearances by Hawkeye, Iron Man, Wonder Man, Tigra. The Thing releases Susan, who releases Torch. Johnny then attacks Rama-Tut, who flees into a secret passage. This is duplicated in Dr. Strange #53 pg. 14 p. 2-5 and West Coast Avengers #23 pg. 7 p. 7 (flashback). Appearances by Human Torch II, Thing, Rama-Tut, Invisible Girl. The Avengers battle the guards. Appearances by Hawkeye, Iron Man, Wonder Man, Tigra. Rama-Tut escapes via a secret passage. This is duplicated in West Coast Avengers #22 pg. 14 p. 2. Appearances by Rama-Tut. The Fantastic Four begin to make their escape. Partially duplicated in Dr. Strange #53 pg. 15 p. 1-2. Appearances by Human Torch II, Thing, Invisible Girl. Strange directs Blessing to release his body. Appearances by Dr. Strange, Morgana Blessing. The Fantastic Four rescue Reed. Appearances by Human Torch II, Thing, Mr. Fantastic, Invisible Girl. Rama-Tut runs into Strange and Blessing and activates some automated defense lasers. Just as Blessing and Strange leave... Appearances by Dr. Strange, Rama-Tut, Morgana Blessing. The Fantastic Four melt their way into the heart of the Sphinx where Strange was just standing. They discover Rama-Tut on a viewscreen. This scene is duplicated, in part, in Dr. Strange #53 pg. 16 p. 6-7. Appearances by Human Torch II, Thing, Mr. Fantastic, Invisible Girl, Rama-Tut. Ozymandias wanders the corridors of the Sphinx and sneaks past the Fantastic Four as they find the aforementioned viewscreen. Appearances by Ozymandius, Human Torch II. Strange uses the Eye of Agamotto on Blessing. Appearances by Dr. Strange, Morgana Blessing. Rama-Tut unleashes more traps on the Fantastic Four. Appearances by Human Torch II, Thing, Mr. Fantastic, Invisible Girl. The Avengers finish off the guards and try another corridor. Appearances by Hawkeye, Iron Man, Wonder Man, Tigra. Apocalypse starts destroying Rama-Tut's technology within the Sphinx. Appearances by Apocalypse, Ozymandius. The Avengers, still in the Sphinx, feel the place begin to fall apart. Appearances by Hawkeye, Iron Man, Wonder Man, Tigra. Rama-Tut's escape pod begins its launch. Strange and Blessing stand outside the Sphinx and watch. Appearances by Dr. Strange, Morgan Blessing. Reed and Rama-Tut exchange taunts, as Rama-Tut launches his escape capsule. Appearances by Human Torch II, Thing, Mr. Fantastic, Rama-Tut. The Avengers see Rama-Tut's escape on a viewscreen. Appearances by Hawkeye, Iron Man, Wonder Man, Tigra. Egyptians outside watch Rama-Tut's escape and begin to panic. The Fantastic Four find the optic nerve restorer and leave the Sphinx. This scene is duplicated in West Coast Avengers #22 pg. 19 p. 1-4 and Rise of Apocalypse #4 pg. 19 p. 3. Appearances by Human Torch II, Thing, Mr. Fantastic, Invisible Girl. The Avengers are right behind the Fantastic Four. Appearances by Hawkeye, Iron Man, Wonder Man, Tigra. The Fantastic Four run across the desert sand as the Sphinx begins to explode. This scene is duplicated in Rise of Apocalypse #4 pg. 19 p. 4. Appearances by Thing, Mr. Fantastic, Human Torch II, Invisible Girl. Strange and Blessing watch the Sphinx explode and exchange goodbyes. Strange leaves. This scene is duplicated in West Coast Avengers #22 pg. 20 p. 1-4. Appearances by Dr. Strange, Morgana Blessing. The Avengers leave the Sphinx. Appearances by Hawkeye, Iron Man, Wonder Man, Tigra. The Fantastic Four see the time machine effect activated over their heads. This is the last scene of the original story with the Fantastic Four in ancient Egypt. This is duplicated in West Coast Avengers #22 pg. 20 p. 7. Appearances by Human Torch II, Invisible Girl, Mr. Fantastic, Thing. The Avengers watch as the Fantastic Four vanish. Appearances by Hawkeye, Iron Man, Wonder Man, Tigra, Invisible Girl, Human Torch II, Thing, Mr. Fantastic. The Avengers battle some Egyptian guards and head back to the Temple of Khonshu, where a priest tells them how all the storylines intertwine. Appearances by Iron Man, Hawkeye, Wonder Man, Tigra, Statue of Khonshu, Khonshu Priest. Apocalypse emerges from the now-destroyed, but still smoldering, Sphinx. Appearances by Apocalypse. The Avengers are saved by Hank Pym, Firebird, and Moon Knight. Appearances by Hank Pym, Moon Knight, Firebird, Iron Man, Tigra, Wonder Man, Hawkeye, Statue of Khonshu, Khonshu Priest. 2810 BC - Apocalypse visits an aging Nephri for the last time. Appearances by Apocalypse, Nephri.